Sunday I packed up LME and drove to my sister’s in North Carolina for our birthday. It’s not a huge trip by any means, but it’s the longest I’ve done – approximately 325 miles each way – and I got back this afternoon. I haven’t done much other than the occasional commute recently, so I wasn’t sure how tiring it would be. 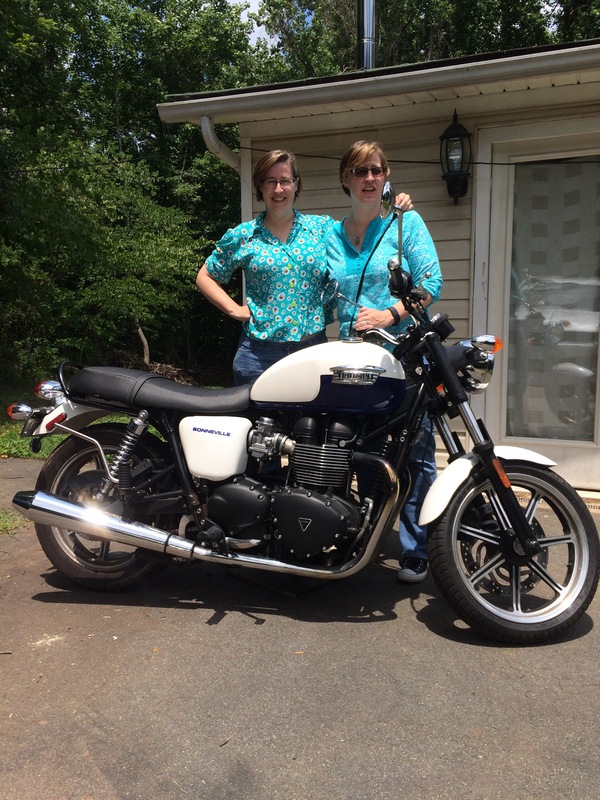 I definitely took a wind beating – LME is a stock Triumph Bonneville 2014, so no wind protection at all. I way underestimated how 8+ hours of that would feel, LOL, and according to my sister, as soon as my head hit the pillow at her house, I was OUT. On the plus side, tomorrow is Day 1 of the July kettlebell swing challenge – so even though it’s not really an arm workout, they’ll get some work just holding The Harpy (27#). I’ll also be doing some extra work on the pull up bar (with assistance bands) so between those, hopefully the next long trip will be easier. Second lesson: some ideas just need to die. Not motorcycle riding, LOL; it actually was a great trip and in spite of the exhaustion and portended-and-overly-prepped-for-but-thankfully-nonappearing rain, it still ended up being a good idea in the light of day (unlike some other 2 am decisions). But in 2015… There I was at a gas pump just finishing filling the tank, and a gentleman walked over commenting on the bike. He literally jumped a little when he recognized I was female and said “women can’t drive those!”. His shock was so genuine, I played it off like a joke (because, really, there I was riding it). But it occurred to me he might actually believe that, which is more what astonished me. Heads up, sir, not only do women drive motorcycles, the first woman to cross the United States on a motorcycle did so in 1915 (with her mother, no less). 1915!